This is a reference text to which teachers, graduate students, and biomedical investigators can turn for information. In molecular biology, much of the research is done on cell fractions or on cell lines that can be cultivated in vitro. While much is being learned, the assumption that cells function in the controlled environment of the culture vessel in exactly the same way that they do in the intact organism is questionable. Bloom and Fawcett serves as a valuable repository of information needed by molecular biologists when they attempt to apply their skills to the heterogeneous associations of interacting cells that make up the tissues and organs of the body. The book begins with a detailed description of the structure and function of the cell and its several organelles. This is followed by chapters on each of the basic tissues and on the organization of each of the organs. 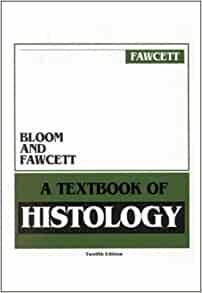 While other textbooks of histology confine themselves to coverage of the microscopic structures of tissues and organs, Bloom and Fawcett is distinguished by the inclusion of brief sections on the histophysiology of each of the organs. This book should be of interest to anatomists, cell biologists and the respective support institutions. As a functional histologist, Don Fawcett was the best. No book like it for a course that isn't taught any more. Illustrations are first class. I used this book in both my undergraduate science courses and those in medical school during the first two years. This text has excellent photos of electron microscope images, as well as micrographs, schematic depictions, photomicrographs and more. I have seen all or most of these depictions in many of my practical examinations and was adequately prepared because of this book. The text is clear, concise and informative. I highly recommend this book without hesitation. Good luck finding one, though! My histology instructor really wanted to buy mine, but I wouldn't sell! 5つ星のうち5.0The best of the best. My copy has yellowing pages and the spine is broken, but I still cannot find a more valuable reference not only for histology but also to understand the complexity of organ structure and function. It doesn't get any better and will never be out of date, even if it is out of print!! !